1 – Within a container, mix the pre-baking ingredients. Cover with plastic wrap and let stand in a protected location 01h30min. 2 – Make topping by mixing flour, sugar and margarine with your fingertips, until a crumbly and book. 3 – After the rest time, in another container mix flour and dried yeast. Add sugar and salt and mix. 4 – Add water, incorporating the pre-baking, add eggs and mix. Add the butter and knead the dough until it is smooth and elastic. 5 – Cover the dough with plastic and let stand 20 minutes. Cut the dough into pieces 70g, boleie to, shortly thereafter, modele no ferradura format. 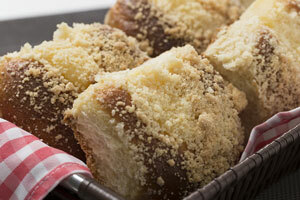 6 – Arrange the rolls on greased with margarine, about 4 cm distance between them. Let rise in lease protected until doubled in volume. 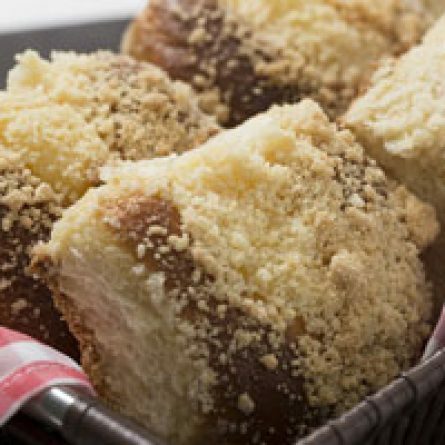 7- With the aid of a sleeve confectioners, GOLDEN CREAM apply the icing on each of the rolls and finish with the streusel. Bake at 180 ° C for about 30 minutes.